Did you know that in the few seconds it takes you to read this sentence your body would have created around 120 million red blood cells? Or in one minute around 41 boxes of Weet-Bix are bought in Australia alone? 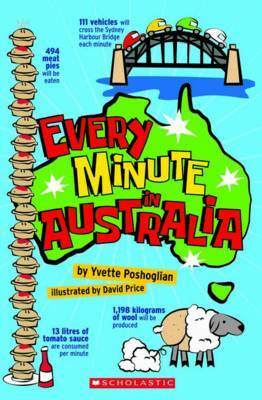 Every Minute in Australia is a ‘did-you-know’ book packed with hundreds of awesome facts based in Australia. I love reading books like this because it is fascinating to see what is happening around the country and the world right this minute. What I found was really good, was at the end of each topic there are activities for kids to do for fun. The book doesn’t just contain simple facts but some more elaborate stories of how those facts came to be and what makes them so special to be in this book. ← Fly Guy vs. the Fly Swatter.